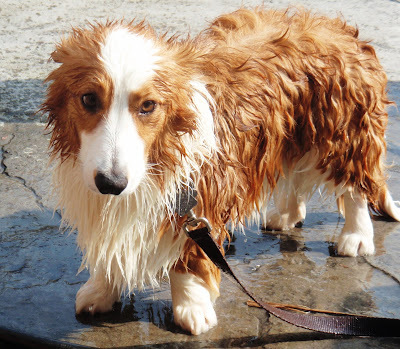 The Chronicles of Cardigan: Soapy Corgis, Dog Packs Online and OMG, Facebook Ads Work! 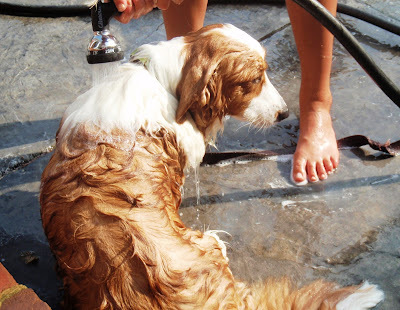 Soapy Corgis, Dog Packs Online and OMG, Facebook Ads Work! So, a few two of you might recognize some (or all, if you've been following since the olden days, when I was wearing a size smaller) of these photos. None of them are new; it's just that I'm about to talk about spending money on Facebook. 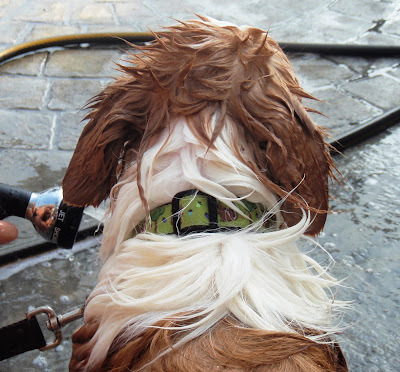 And for some reason, that made me think of going to the cleaners and/or taking a bath, so naturally, I wanted to post photos of the dogs taking a bath. Except, I didn't feel like staging baths just for the photos, plus I'm tired, and my creativity is bobbing for air in a toilet bowl somewhere, sOOOOooooo, I'm posting these re-run pics instead. But, I promise, they're still as cute as ever! Oh where, oh where have Jon Farleigh's ears gone...? And, speaking of cute, have you heard of Pack (packlove.com)? So anyway, if you haven't yet, and you like being social with your dog (online at least), you should go over and take a look. 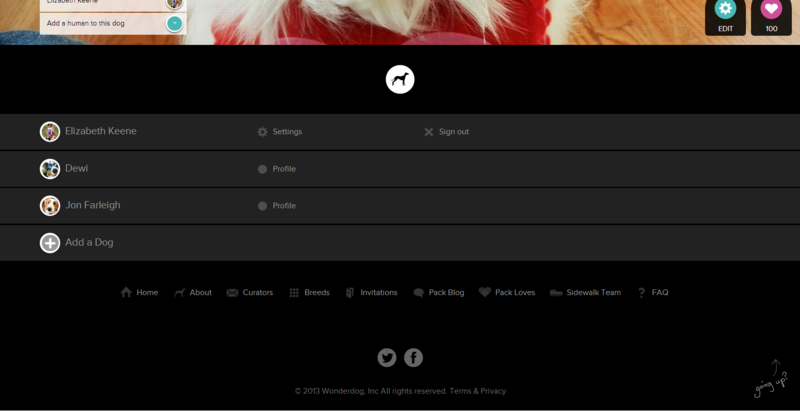 Remember, though, that the site is still a cyber "baby," with lots of fun functionality still in development. What's not in development, though, (because I've been subscribed for over a month) is a weekly e-newsletter for your dog(s)' particular breed/mix. 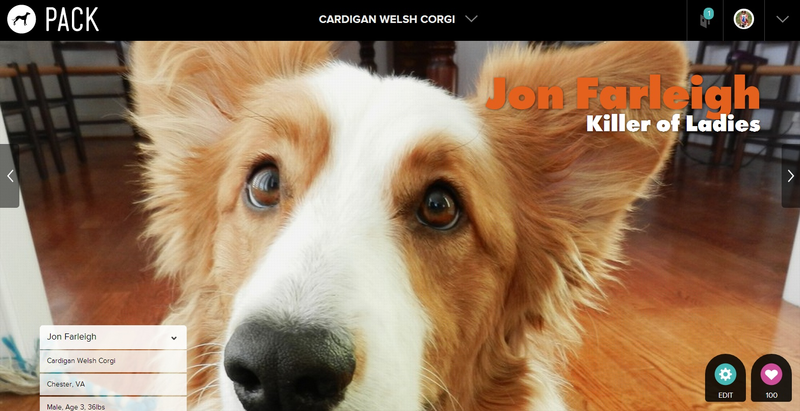 And, it just so happens that I'm the author/curator for the Cardigan Welsh Corgi newsletter, and you can sign up for it RIGHT HERE, if you want! ;-) You don't have to be a member of Pack to subscribe (not yet, anyway). #1: For as little as $1 (max) spent per day (for however many days you specify), you can run a Facebook ad for your blog/business fan page. If you have a fan page already, I know you've seen the Boost Post button under all your status updates, and I'm sure you've received at least one pop-up from Facebook, prompting you to create an ad to promote your page. And perhaps, if you've clicked either a Boost Post button or pop-up ad, you've seen the pre-filled $10/day budget in the ad generator (which might have prompted you to roll your eyes and/or mutter expletives for wasting your precious time). I mean, who the heck has $10/day to blow on a Facebook ad for a blog?! I certainly don't. So, has this been helpful? Has anyone else tried Facebook ads? As always (because this information has been fairly high-level), I'm happy to answer any questions! * The minimum daily budget cannot be less than $1. I tried. ** The amount you spend per ad, per day will never be more than your budget. Facebook charges are calculated based on CPM (cost per impression), meaning that you are charged each time someone clicks your ad. Therefore, it is possible that if your ad generates few clicks, you'll spend less than your daily budget. Conversely, if your ad-clicks quickly reach your daily allotment (per budget), Facebook will pull your ad for the remainder of the day (so your budget is not exceeded). Disclosure: I was not compensated for this post. Facebook's britches are much too big for the likes of little ole me. P.S. Have an awesome day! Thanks for reading! And "liking"! I heart y'all! I ran a traditional Facebook ad (I had a $50 free thing from GoDaddy when I set my author site up with them) when I released "What the Dog Ate" and it generated a good # of likes, but I couldn't really see that it turned into book sales, so if I'd spent my *own* $50 I probably wouldn't have been happy. Because of that experience, I hadn't planned to do any more Facebook advertising, but this makes me think it might be a good idea to pay to promote a post once my new book is out. Sounds like it's a fairly cheap way to get some good exposure. Yes, Jackie, it's difficult to determine cost-effectiveness (without a complicated analytics study), but for a small blogger who wants to get noticed a bit more, I definitely think it has advantages. A new book post (in your case) would def. be something to consider boosting. Great pictures of your pups :) I have a totally awesome success story with FB ads. I decided one day I was going to "promote my page" for more likes and spend $5 max in 24 hours. I was also having a giveaway. I took a nap, and woke up to about 1,000 new likes... I was literally in shock! I spent up all of my $5 and ended up with about 1200 new likes in less than 24 hours... I've done a promote a post one too but am not really sure if the results from that were all that great. 1,200 in 24 hours for $5, Ann?! You should write a testimonial on Facebook's Small Business page! We will have to look into this. Thanks for letting us know. Have a serene Sunday. Loving the little trip down memory lane of the soaped up boys! Thanks for the FB in-service! It's not something I would have considered before, it's great to have a first hand account! I've been using Facebook Ads for over a year now to promote posts and my page in general. I know not everyone can or wants to pay Facebook but I agree that ads are very effective! If you can increase the amount over $1, it pays off. Hmmm...that is the first time I have heard from anyone that has tried it. I may have to give it a whirl. Thanks for posting! I'm glad my heart didn't stop beating from the cute overdose and that I made it through the rest of the post. In fact, I sent this link to Suzy, in charge of marketing for Jones. This is great! Thanks! P.S. Having a giveaway on the blog today! I'm glad you made it, too, Flea. I don't know CPR and I would hate to get sued. (har har) Thanks for sending to your marketing person!! Wait. 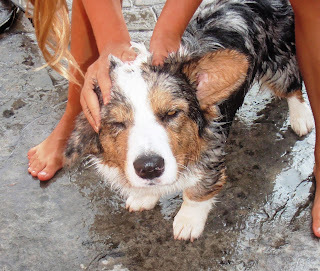 Are there actually people who don't want to see soaped up Corgi Cuteness? Sickos! Soapy Corgis are adorable!! This is good info, probably best results in something like a contest or getting "likes." Like Jackie, I'd have to consider if the ads would result in book sales. Since royalties are so low to begin with, if we spend too much we'll lose money with each book sold! Soapy corgis? Way cuter than I expected!